On Friday, Google gave Windows users something that they’ve been pining for: A Start button. And even better than that, Google’s version keeps you on the desktop and actually opens a pop-up menu full of programs, unlike the nerfed Start button that’s slated to appear in the Windows 8.1 update. No, Larry Page hasn’t decided to jump into the crowded Windows Start button replacement arena. Instead, Google’s engineers quietly dragged Chrome OS’s App Launcher—the Googlefied equivalent of a Start button—over to Chrome for Windows today. The seemingly simple addition is a major step in Google’s push to bring Web standards to walled gardens. 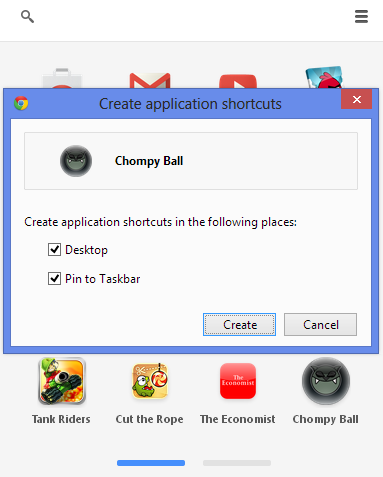 The Chrome App Launcher is exactly what you’d expect: A taskbar icon that lets you quick-launch Chrome browser apps, such as Gmail, the Play Store, Angry Birds, and yep, even Chrome itself. Simple, right? But the little launcher is a Trojan horse for much bigger ambitions—especially when paired with packaged Chrome apps. Packaged apps are available now, but since Google has yet to highlight them in the Chrome Web Store, you might not be familiar with them. Packaged apps are programs built on the bones of the Chrome browser. They use traditional Web languages such as HTML5 and CSS, but they run as separate, standalone software that can also be used offline, unlike traditional browsers. You could consider packaged apps to basically be desktop Web apps, as odd as that sounds. Hey, who put Chrome OS’s Start button where my Windows Start button used to be? The apps without tiny arrows in their lower-left corner are all packaged apps. With the arrival of packaged apps and the Chrome App Launcher, no longer will you need to connect to the Internet, open the Chrome browser, and launch the Web app you want to use. Now, there’s a Web-app Start button right on your taskbar, and the packaged apps don’t even require an Internet connection. 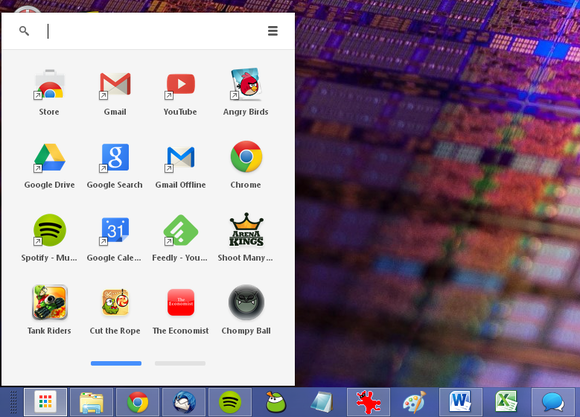 It’s made even easier by the App Launcher’s Chrome tie-in. All your Chrome apps seamlessly travel with you to any Windows PC on which you’ve installed the Chrome App Launcher, even the locally stored package apps (though those take a few moments to download to new installations). Download a Chrome app once, and it’s available anywhere. What’s more, the Chrome App Launcher lets you pin shortcuts for specific apps to the Windows taskbar or the desktop—mimicking native software functionality even further. It doesn’t matter whether the app is packaged or a Web native, either. Blurring the lines, indeed. As a Web-focused company, Google gains whenever more people start using the Web more often. But beyond generally coaxing the world to Web services, Google has a direct interest in getting people in front of Google’s Web services. That’s the reason the Chrome App Launcher comes chock full of links to YouTube, Chrome, Gmail, Google Drive, Google Search, and the Chrome Web Store (whose third-party apps often include Google Ads). 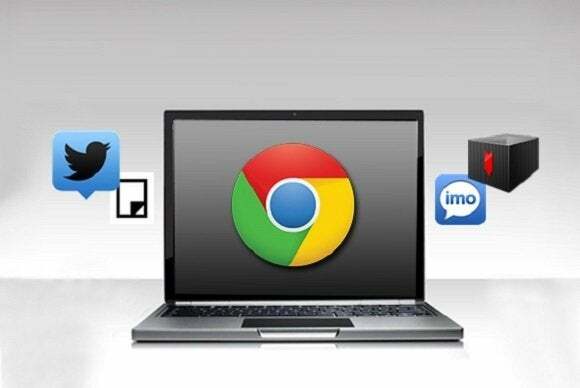 ”It looks like Google is defining the Chrome platform as what I’d call ‘Web Platform Plus,’” says IDC’s Hilwa. More notably, though they may appear as standalone offline programs, packaged apps can work only if you have Chrome installed. Not only are they built on top of the browser, but some of the advanced features being packed into packaged apps—such as in-app payment support or the ability to play nice with Fitbits and iTunes libraries—come courtesy of proprietary Google APIs, not open Web standards. That’s a price you have to pay for running those apps closer to the metal, so to speak. It also means that while the Chrome App Launcher is indeed a force to spur general Web adoption to traditionally offline platforms, packaged apps in particular are inextricably tied to Chrome—which, in turn, makes Google’s browser-centric Chrome OS more appealing, too. “It looks like Google is defining the Chrome platform as what I’d call ‘Web Platform Plus,’ and intends for Chrome OS and the Chrome browser to be a ‘platform on a platform’ on any device it is permitted to run on,” Hilwa told PCWorld in a separate interview. Rubin sings a similar tune. 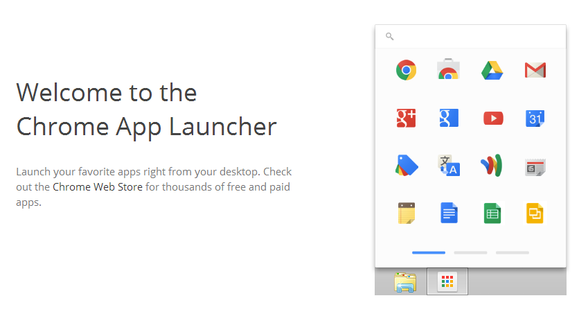 In other words, the Chrome App Launcher is a way for Google to have its cake and eat it too. Google wants as many people as possible to embrace open Web standards, no doubt at least partially motivated by the desire to bring its services (read: ads) to as many eyeballs as possible. Open standards tend to be used by everyone, after all. But packaged apps bind their users to Chrome specifically, though Chrome is available far and wide and across multiple platforms. That seems slightly ominous in the wake of Google’s transition from the open Google Talk to the proprietary Hangouts protocol. But fear not: Chrome isn’t going to devour the desktop and the Web overnight. Google hasn’t even publicly published the Chrome for Windows App Launcher in the Chrome Web Store, and packaged apps are similarly obscured for everyone but developers. You need to have a direct link to find anything. Talk about obscure. If you’re interested in seeing what the low-key yet portentous hubbub is about, you can download the Chrome App Launcher here. Once that’s done, head to Pocketables for a long list of direct links to Chrome packaged apps. Give some a whirl; it’s so seamless, you’d never even know that you were helping to tear down the wall between the online and the offline.